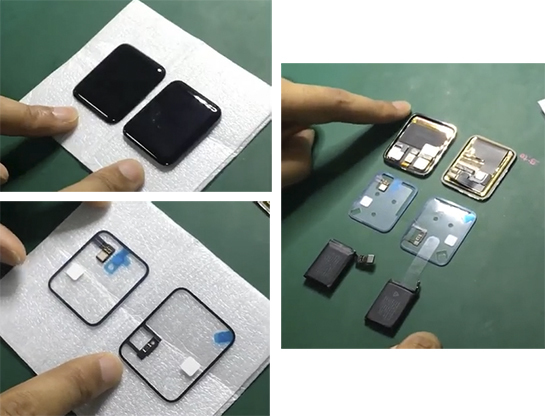 Byte, a small British shop that sells Apple-certified accessories and repair parts for iOS devices, has shared new photos and a video that appear to show the Apple Watch 2's thinner display technology and larger battery. The Apple Watch 2 display looks slightly thinner than the original Apple Watch display when placed side by side, although the second-generation Apple Watch could very well have the same overall thickness as the original model due to the rumored inclusions of a GPS, barometer, and thicker battery. The battery shown is rated for 1.28 watt-hours, which is identical to the battery that surfaced last week. If accurate, that means the 42mm Apple Watch 2 will have a 334 mAh battery that is 35.7% larger than the 246 mAh battery in the original 42mm model. The battery for the 38mm model has yet to be leaked. Also shown is the alleged Force Touch gasket for the Apple Watch 2, which appears to have a new chip alignment but otherwise no discernible differences. Apple is expected to announce the Apple Watch 2 alongside the iPhone 7, iPhone 7 Plus, and spec-bumped Apple Watch 1 models at its September 7 event next week. In addition to a GPS and barometer, other rumored Apple Watch 2 features include a faster processor and improved waterproofing. Typical Apple, so we will probably get the same size but increased battery life? Uuh that's far from typical Apple..
Don't even care if it becomes less functional or convenient because of the shape change. So now people want form over function. Why not just get a mechanical watch? Meh, another incremental design from a company that is incrementally becoming mediocre. Goodbye then. Don't come back. Thin and light is good for the watch. Thin and light is bad for the phone. I am on board with watch getting thinner and lighter. I wonder if they will ever pull off a circular display. When I wore traditional analogue watches, I work rectangle shaped ones. Personally I prefer that over round. As for AW1 Sport, I don't feel like it's heavy, or to heavy. It feels solid. Weight is good. I do have a couple scratches on the glass however. But, I'm about as coordinated as a headless-chicken, and continuously smack my watch into walls, ovens, fridges, door frames etc. don't know about light, as I like a certain heft, but thin is definitely good for a phone.